Extra fees for electricity customers who refuse to accept “smart meters” because they are wary of the new technology would be eliminated by a bill heard by the Senate Finance Committee Tuesday, and any extra costs would be spread across all customers. Utility companies argue these fees are necessary because of the extra cost of continuing to read the old meters. Customers of the Baltimore Gas and Electric Company (BGE), the Potomac Electric Power Company (Pepco) and Delmarva Power and Light (DPL) have been facing “opt-out” fees that came with their option to choose analog meters over smart meters, a new technology utility companies are pushing to implement fully across the state. Smart meters transmit electricity usage by customer to the companies through two-way radio communication. The Public Service Commission last year approved fees for the customers “opt-out” choice. There is an initial upfront cost of $75, followed by a monthly charge ranging from $11 to $17. “The magnitude of these fees will fall disproportionately on some customers, particularly low-income, poor and fixed-income customers,” said Sen. Nathaniel Mcfadden, D-Baltimore City. 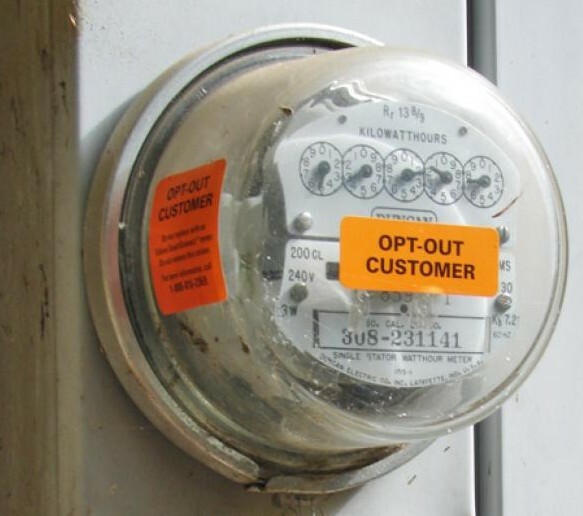 Under SB9, a utility company would not be able to impose “any additional fee or charge” on customers who opt-out of smart meters or request the removal of one. Utilities are using smart meters to keep track of customer electricity usage on a monthly basis. Companies are offering “peak time rebates,” a credit back to a customer’s account for a reduced electricity usage during peak hours. Customers in Pepco and BGE territories have received an estimated peak-time rebate of $17.43 according to Kevin Hughes, chairman of the Public Service Commission (PSC). However, Sen. Delores Kelley is concerned for those who do not receive the rebate and are instead being charged for their decision to opt-out. “Right now people who have opted in are not paying one cent in Maryland, which is clearly not right, while those who opt out are paying the entire cost of all meter reading,” Kelley said. Kelley questioned the PSC on the possibility of spreading costs appropriately, based on the type of system individuals choose to use, instead of focusing costs only on those who have analog readers. The PSC is waiting for opt-out customers to stabilize. Once the PSC receives enough data to determine the effectiveness of smart meters they will re-evaluate “an appropriate cost” and use discretion in any additional costs imposed on those opting out. “I think the commission has really bent over backwards to get these fees as low as we can and still adhere to our principles of cost causation,” said Hughes. The usage on old style meters must be recorded by a person looking at the dials on the meter. Sen. Kelley asked to have a statement on record regarding PSC’s promise to re-evaluate spreading costs based on the effectiveness of smart meters. “Yes, we certainly would look at the whole structure of cost recovery for all meters if that were the case,” Hughes replied. In addition to privacy concerns of the data collection, consumers are choosing to opt-out of smart meters due to uncertainty in the effect of additional radio waves in homes. “The utilities have conducted no research whatsoever on the health impacts of smart meter radiation,” said Dr. Anita Moore, a veterinarian in Anne Arundel County. Moore was among a panel of individuals in favor of SB 9, and believes the radio waves generated by smart meters, when added to waves already being transmitted by household appliances, would have negative effects on health. SB 9 would require PSC to join with the Department of Health and Mental Hygiene (DHMH) in the creating a report that analyzes “health effects of smart meters in the state…radio frequency levels…and evidence-based recommendations relating to the potential health effects of smart meters,” said the bill’s fiscal note. However, the PSC and DHMH believe this information will only be effective if collected on a federal level, and they feel a state government’s findings would be too inconclusive to be trustworthy.